Targeted Individuals Canada: Excerpts from Gordon Thomas' "Journey Into Madness"
Excerpts from Gordon Thomas' "Journey Into Madness"
Excerpts from Journey Into Madness, by Gordon Thomas, p. 283-285 - In California, between his visits to Washington -- he [Casey] would attend only ten of the commission's twenty-six hearings -- Governor Reagan was using his considerable charm to try and maneuver the Legislature to secretly finance a scheme that, when he first heard it, impressed him. The governor, like most Americans, was obsessed with the violence that permeated the nation. Serious crime had reached unprecedented levels. The answer, at least for California, its governor believed, was the one proposal by one of the state's most eminent psychiatrists, Dr. Louis Jolyon West, chairman of the department of psychiatry at the University of California at Los Angeles and director of its Neuropsychiatric Institute. In the early 1960s, when he had been at the University of Oklahoma, Dr. West had run an LSD research program financed by the CIA. He had proposed to the governor the creation of a financially well-endowed multidisciplinary Center for the Study and Reduction of Violence. Within its confines, doctors would explore all types of violent behavior, what caused it, and how it could be detected, prevented, and treated. It was planned to site the Center on a converted missile site in the Santa Monica Mountains. The psychiatrist proposed that the Center deal with persons who displayed antisocial and impulsive aggression. Its laboratories would be devoted to genetic, biochemical, and neurophysiological studies of "violent individuals, including prisoners and hyperkinetic children." Other research would concentrate upon the "pharmacology of violence" and the best way to use "anti-violence inhibiting drugs." One of the tried, though far from proven, techniques of the CIA that Ronald Reagan was helping to investigate in Washington was, in California, being given a warm welcome by him. He eagerly shared Dr. West's conviction that one day the behavior of all persons with violent tendencies -- no one had yet decided the criteria for measuring the degree of violence -- would be monitored by the staff at central control stations presiding over screens producing signals from the implants. The first indication of an abnormal impulse could indicate the onset of violence. Attendants would rush with suitable psychotropic drugs to overpower the person. The system would be expensive to operate, but Governor Reagan visualized the day when thousands of his fellow Californians would be permanently monitored in this way. Among those who was considered to work at the Center was Leonard Rubenstein. Two South American doctors who had worked at the institute under Dr. Cameron had also been targeted, one to run the center's shock room -- which would operate on a twenty-four-hour basis, seven days a week -- and the other to assist in the center's psychosurgical operating suite, where the very latest techniques in lobotomy would be used. The doctors were currently employed in detention centers in Paraguay and Chile. Despite his considerable persuasive techniques, Governor Reagan failed to convince the California legislature to go ahead with Dr. West's proposal (The UCLA Violence Project). 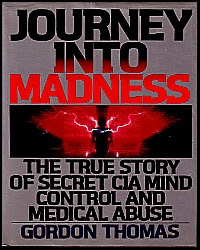 Journey Into Madness: The True Story of Secret CIA Mind Control and Medical Abuse - This 1989 book was written to tell the world about the use of physicians in medical torture of political prisoners. It didn't start in Nazi Germany, and didn't end in Abu Ghraib (drugs, electroshock, gags, garrotes, blindfolds, branding irons, sexual abuse, mock executions). Physicians provide fake medical certificates for persons tortured to death ('Perspectives'). The author had access to written testimony, and off-the-record interviews (which were confirmed from other independent sources). 'Book One' deals with Beirut, the Near East, and the kidnapping of William Buckley, American Political Officer, in 1984. It mentions the survival technique of looking at every approaching face to determine if it is an enemy by the tension displayed on the face (p.59). The Hizballah justified terror as needed to create a new and ideal society (p.61). Brain-washing rarely involved physical cruelty bet depended on the use of repetition, harassment, and humiliation (p.69). [Just like your schooling?] Changing opinions was older that recorded history. America developed the most powerful advertising industry in the world and adapted it to psychological warfare and opinion making. They studied the techniques used by modern American evangelists in conversion, and the Catholic rite of confession (p.73). Pharmaceutical laboratories discovered how drugs can be used in mind control (p.74). How amoral and ignorant was Gov. Reagan (p.81)? 'Book Two' gives the history of the abuse of medical knowledge since WW II. Chapter 5 tells of Allen Dulles and his ruthless and unscrupulous character hidden beneath his cheerful and witty personality. The Korean War provided a new shock from former POWs (pp.94-95). The "twilight zone" is described (p.97). They could not understand the changed views of POWs! Chapter 7 notes how conscientious objectors were put into mental hospitals and used as test animals (pp.140-141)! Chapter 8 tells about electroshock treatments at the Allan Memorial Institute which went beyond the norm (p.149). Were there studies reminiscent of Dr. Josef Mengele at Auschwitz (p.150)? Allen Dulles continued with his drug experiments and poisonous mushrooms (pp.156-157). It tells of the poisoning death of Dr. Frank Olson (pp.160-162). [To shut him up?] Chapter 10 has a 'Top Secret' recording of Korean War POWs (pp.184-186); did you understand it? Was it caused by learning a new view of society? Chapter 11 tellis of the use of sensory deprivation experiments to cause irreversible damage to a patient's mind. Chapter 12 gives an example of post-event predictions (p.216). Chapter 13 tells how Dr. Mary Morrow was able to escape from the tortures of Dr. Ewen Cameron (pp.230-231). Chapter 14 gives the results of hypnotism to create a sleeper killer (p.253). Chapter 15 explains why the Vietcong succeeded (p.257). Truthful reports had bad consequences (p.258).Who controlled Oswald (p.260)? Could the CIA handle the truth (p.261)? NO (p.263)! Could psychics read minds from a distance (p.273)? Or devil worship (p.275)? 'Book Three' covers the events after Watergate. Chapter 17 tells about briefing President-elect Reagan. Claire Sterling's "The Terror Network" is evaluated (p.321). Could Agca have been brainwashed to make him an assassin (p.326)? Chapter 19 tells how the CIA created the cruelest police in the Arab world (p.328). All the bugs planted in Sadat's presidential palace did not warn of the assassination. Examples of medical torture are on pages 334-335. Torture by physicians goes back to the Roman Empire (p.346), to the English in Kenya (p.348); it wasn't just the Nazis. Science is always at the service of the rulers. "Hooding prisoners" was used in 1865 for the Lincoln assassination conspirators (p.356). The 'Notes' provides background information on this book (Amazon).